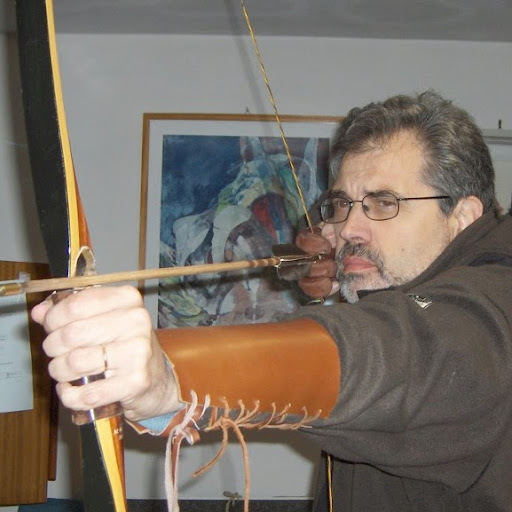 There is an old story in Italy (but also in other Mediterranean regions) that tells of a man who tried to train his donkey to work without food. So, he gradually reduced the beast's daily ration of hay. Later on, the man reported that, unfortunately, the donkey had died just when it had learned to go without any food at all. The man of the story must have been an economist. He was trying to optimize the system and he had defined the "efficiency" of the donkey as the ratio of the work performed divided by the amount of hay consumed. He had found that reducing the amount of hay improved efficiency and, with impeccable logic, had brought the idea to its natural conclusion. Something similar seems to be taking place with the economy of whole countries. Economists define as "efficiency" the ratio of the GDP produced per unit of energy consumed. Noting that this ratio has been increasing for many Western economies during the past decades, they conclude that economies are becoming more and more efficient. They even speak of "decoupling", noting that the GDP can keep increasing while the energy consumption remains constant - or decreases. This is supposed to be a wonderful thing. The increase in efficiency shown by the graph is a pure illusion. 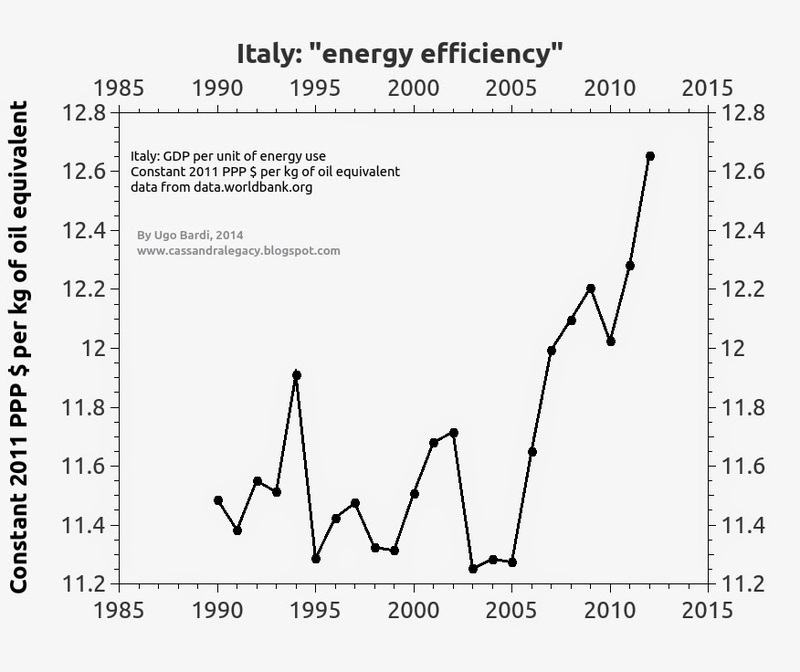 The Italian economy is not becoming more efficient but, simply, contracting. Industries are closing down and people become unemployed. As a consequence, less energy is consumed in manufacturing and for transportation. At the same time, other elements of the economic system, say, rents or property taxes, remain relatively unaffected; government spending, for instance, tends to go up. Hence, the GDP doesn't decrease as fast as energy consumption and the ratio of the two increases (*). Obviously, that's nothing to be happy about. Concepts such as "efficiency" and "decoupling" seem to be based on highly aggregated parameters; too much to provide a useful interpretation of what's happening in a country's economy. That doesn't mean that the economy cannot get more efficient with time, just as a donkey may learn to work even with a reduced hay reaction. But, without energy, and especially without cheap and abundant energy, an economy simply starves and, eventually, it suffers the fate of the donkey of the story. (*) The increase in the GDP/energy consumption ratio can be simulated by a dynamic model and it can be shown that it is just an effect of the time lag in the process of transformation of natural resources into capital. But that will take another post to explain. "Industries are closing down and people become unemployed. As a consequence, less energy is consumed". Hey?? Are you not the kind of guy thanks to whom I understood it works exactly the other way round? Unfortunately, the different parts of the economy are so interconnected, with so many feedbacks, plus the gap between the energy prices and the energy productivities is so huge, that this process works poorly compared to what we would need (just the same as PV :-) !). Given our energy situation, we don't need the energy efficiency to be multiplied by 1.1, we need it to be multiplied by 3 ! Another way to try to understand the (once again, slight) increase in energy productivity would be to make a link with the fact that inequalities tend to start rising when growth ceases. Maybe is this simply because the lack of growth makes people feel insecure and reminds them that they are meant to fight hard for the top places, a task at which the already rich are much more gifted, at least when they try for real ? In the same way, the revival of competition could boost the efficiency of the economy (at the expense of its resilience, which is not good news). 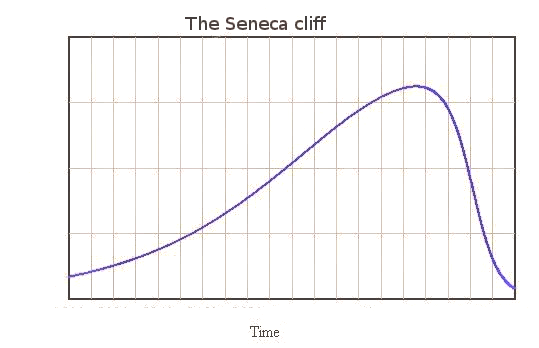 And don't throw this curve away, it's useful to monitor what happens next! Can't 'collapse' be defined as an instance of strongly declining energy efficiency? Well, MG, I am not sure of what is your point. If industries close down, less energy is consumed. I would be very surprised if it were the opposite! Ah.. about your question "And don't throw this curve away, it's useful to monitor what happens next! Can't 'collapse' be defined as an instance of strongly declining energy efficiency?" > Better said, a lot of energy is consumed by tourists in coming here by plane, but not directly by the Italian tourism industry. But then, for lack of a viable alternative to kerosene*, that will last only as long as oil remains as cheap and abundant as it is now**. As we all know, since we've more or less hit peak oil, that won't last much longer… while it's very unlikely that affordable, synthetic oil** will be available in time. "What Are Our Alternatives, If Fossil Fuels Are a Problem?" * viable = on the market in the next twenty years, same energy density, compatible with existing motors, production cost equal to what it is now, without using land used for agriculture, without emitting greenhouse gases, etc. That article was written back in 2007? Energy technologies have progressed fast since then (knock on wood). Zooming in on complex details to make sweeping generalizations is a way of obscuring truth. A dirty trick and method of propaganda. For the man with the donkey to have a plausible theory the donkey would have had to find other ways of feeding itself. Society has not experienced any fundamental changes recently so that's ruled out. The donkey starves. Regardless Jevon's paradox has a way of cancelling out any improvements in efficiency. I'll add an excerpt from my link that gets you to Jevon's. But as the efficiency of the instrumental means of putting the energy to work has not increased recently the logical conclusion becomes that culture is in decline. There is a Sufi version of this story, in which a 'teacher' offering Enlightenment starves a callow disciple to death: 'What a pity, he was just about to reach Enlightenment!'. We must also bear in mind the trumpeting of the success of Austerity when it's claimed that exports exceeding imports is a miracle. how it's possible that energy and resources poor country (first coal and later oil) without colonies such Italy, manage to become one of the most industrialized and influent country in the world being part of the G8 since the begining? What is happening nowadays I can understand much better. Can you try to give me an explanation or at least an opinion of yours, please? Thank you so much for your blog.